Funny how a short post on the Twitter blog could spark an online discussion that even led to the long-standing Twitter vs. Facebook war. Yesterday, a post on the Twitter blog announced that we, Twitter users are now sending 50 million tweets into the Twitter-sphere everyday. Now, how’s that for another issues that says Twitter is not growing? But anyway, yes Twitter has just grown to 50 million tweets a day. Up from 5,000 times a day in 2007, 300,000 in 2008 and 2.5 million in 2009. 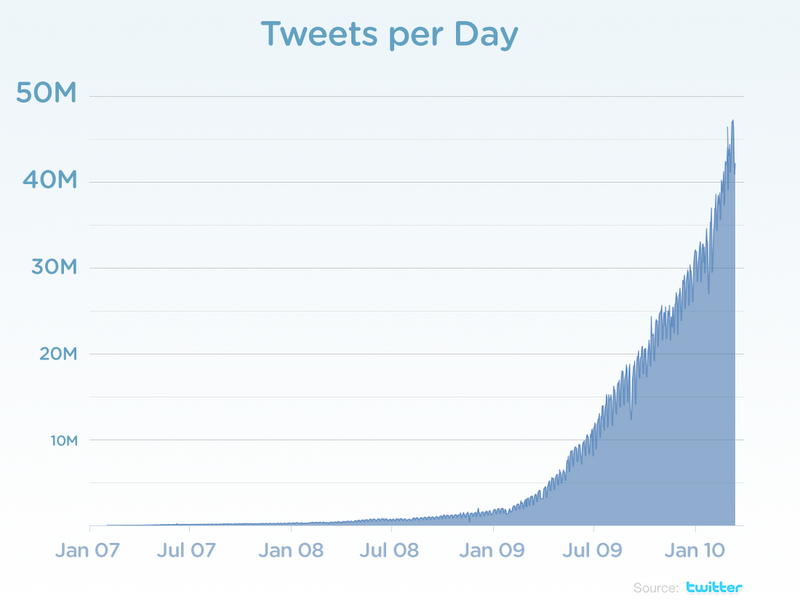 Right now, it’s at a 50 million per day or 600 tweets per second. If you won’t call that exponential growth, I have no idea what else you can call this phenomenon. And that doesn’t include spammy tweets. Twitter has removed tweets from accounts that were identified as spam. Now, the issue that were raised by some analyst is whether Facebook has all the reason to be afraid of Twitter’s growth. Facebook updates were last reported at 60 million per day. That means that Twitter is fast catching up. But that is in terms of daily updates. When it comes to total number of users and even monthly page views – Twitter is still far inferior to Facebook. I really think that there is no point of comparison here and we should all try to pause for awhile and rethink how we view Twitter vis-a-vis Facebook. I’m more inclined to think that Twitter compliments Facebook. Facebook is more of a social networking site while Twitter is more of a real-time online communication tool. But then, who am I to change this predominant mindset, anyway?